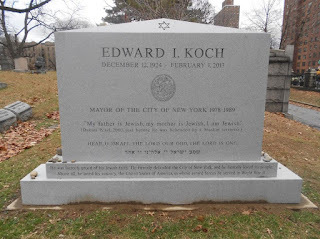 Edward I. Koch, New York City's beloved mayor (and my favorite) died six years ago today. It was a privilege to attend his funeral, and write about it for 'American Funeral Director.' Of the thousands of funerals I've been at over the years, Mayor Koch's remains my favorite. It incorporated all the elements of a good funeral, and the memory of his casket being shouldered out of Temple Emanu-El to the tune of New York New York is indelible. Mayor Koch is buried in Trinity Cemetery (uptown).